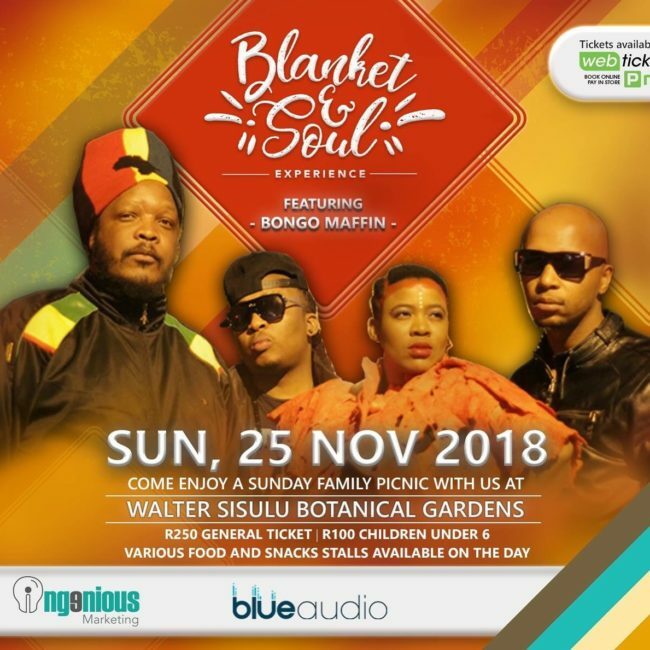 Blanket and Soul Experience presents its 3rd annual outdoor experiential picnic suitable for the entire family. Come and enjoy good music, get up-close and personal with the world renown Afropolitan, Soulful, Afro-Pop Dance Quartet; Bongo Maffin. The Quartet will mesmerize us with great music and all our old school favourites. Join us on Sunday, 25 November 2018 at Walter Sisulu Botanical Garden. Expect hilarious moments with the MC The Funny Chef. Enjoy the toe-tapping rhythms and sweet sounds from the DJ’s repertoire. We catering for the entire family, we have a dedicated kiddies area with face painting, tattoos, colouring in, jumping castles, water slides, gladiator slides etc. If you don’t have your picnic basket sorted, do not worry, food and drinks will be on sale. Cost: R30 – R250 for general ticket. Get R50 off the first 100 general tickets on 23 November 2018.